Nicolas Field is born in London in 1975. He studied drums and percussion at the Amsterdam Conservatorium (1996-2002), sonology at The Hague Conservatorium (1997-2002) and "Art and Media" at HEAD in Geneva (2007-2009). He has received multiple awards and was artist in residence at the Swiss Institute in Rome (2010-11), AirAntwerpen (2011), Belluard Bollwerk international (2013-14) and Johannesburg South-Africa (2015). Early 2000, he starts travelling through Europe as a drummer with different bands (improvised music, contemporary music and jazz). Over time and tours, that also take him to the US, Japan, Korea and Australia, Nicolas Field collaborates with musicians such as Tetuzi Akyama (guitar), Akira Sakata (saxophone), Otomo Yoshihide (guitar), Keiji Haino (guitar), the band Cactus Truck, Didi Bruckmayr (vocals), Jacques Demierre (piano), Gilles Aubry (electronics) or Fritz Welch (drums/vocals). 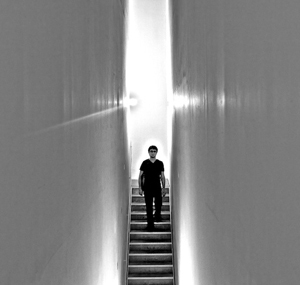 In parallel, in 2008, Nicolas Field starts building his first visual art works, taking the shape of sound installations. His works has been shown at the Maison d’Ailleurs in Yverdon (2008 - Think Thrice), at Lift Geneva (2010 - Think Thrice), at the Design biennale in St-Etienne (2010 - Think Thrice), at Crisalide Festival in Forli (2011 - Shimmering Beast), at Burgtheater in Vienna (2012 - Shimmering Beast), at the “Corpo 6” gallery in Berlin (2012 - Making a mess for the masses), at Netwerk-center for contemporary art in Aalst (2014 - Shimmering Beast and All Tones), at the Maison des Moines in Romainmôtier (2016 - Shimmering Beast), at the MEG in Geneva (2016 - Contes Sonores) for the exhibition "Le Chamane et la pensée de la forêt", at the Embassy of Foreign Artists in Geneva (EoFA) (2017 - This is one of the ways you claim land) and at the Festival Novas Frequenciãs in Rio de Janeiro (2017 - To the Bone). Nicolas has also worked for several years in dance and theatre performances as a composer, musician and performer. In Switzerland, he has collaborated with the dance company 7273, the dancer Mohamed Toukabri, the "Sugar-Free" collective as well as with the performers Marie-Caroline Hominal and Gilles Furtwängler. He also works regularly with the Belgian company Needcompany, as a composer and musician ("OHNO Cooperation" and Caligula at the Burgtheater in Vienna in 2012), but also as a performer (Rhythm Conference feat. Inner Splits in 2015), (O, or the Challenge Of This Particular Show Was To Have Words Ending In O in 2016) and (Concert by a Band Facing the Wrong Way in 2018). In 2019 he will take part in the show Alice au théâtre de Vidy and Les Halles de Sierre with the CATATAC company.